More cuts to the active-duty Air Force look increasingly likely now that Congress and state lawmakers have rejected a proposal to reverse proposed cuts to the Air National Guard as part of the fiscal 2013 budget. 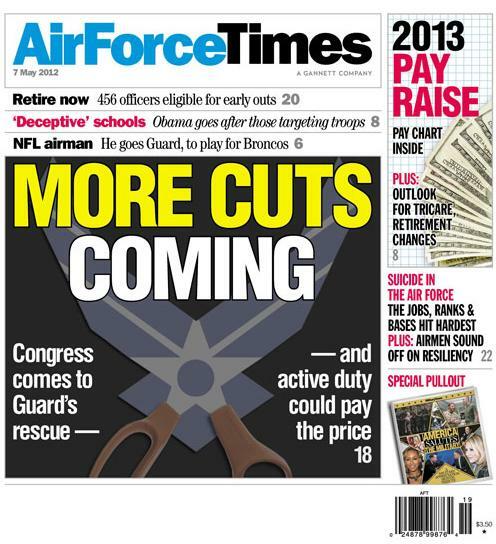 “No deal is likely until the Air Force is prepared to make roughly equal manpower cuts to the Guard and the active-duty force as a proportion of each component’s overall end strength,” Sen. Patrick Leahy, D-Vt., and co-chairman of the National Guard caucus, said in a statement to Air Force Times. Defense Secretary Leon Panetta had offered a compromise to lawmakers that proposed to restore about 2,200 of the Air National Guard personnel and 24 aircraft slated to be eliminated next fiscal year, but lawmakers rejected the deal, saying the aircraft would have to be retired soon anyway and the personnel cuts would come up again next year. “Restoring only 2,200 Air Guard Personnel means the Air Force has still failed to meet the governors in the middle on personnel cuts,” Leahy said, adding that any deal must include more cuts to the active-duty component. In other news, the Air Force has seen a spike in suicides during the first three months of 2012, and airmen say resiliency alone cannot stem the tide. They blame the suicides on being overworked, stressed about their futures and tired of doing more with less. Mark Lerner, a clinical and forensic psychologist who specializes in traumatic stress, said people need to learn practical strategies to turn their pain into productive energy. Airmen say the way to reduce suicides is to give them more time off and more resources at work to get their jobs done. “It just seems the more and more we try to give our guys a break, the more we have to do some computer-based training,” said a maintainer, who asked not to be named.